The Citrus County Sheriff’s Office is looking for a missing adult, first reported missing on Wednesday. Kerry Ann Kilcullen is a 36-year-old white female, 5 feet 5 inches tall, 220 pounds, with brown hair and brown eyes. She has multiple tattoos, unknown descriptions. Kerry was last seen in the area of Crystal River, at noon on Thursday. At that time, she was wearing blue jeans, a black t-shirt, a green hooded jacket, white tennis shoes, and carrying a black backpack. She was thought to be on her way to Tampa, or Sebring. 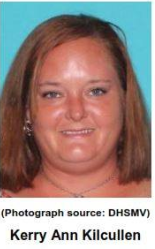 If you have seen Kerry or know her whereabouts, please contact the Citrus County Sheriff’s Office at 352-726-1121 and ask for the Major Crimes Unit. To remain anonymous and possibly be eligible for a reward, contact Citrus County Crime Stoppers at 1-888-269-8477 or online at www.crimestopperscitrus.com.